Add distinctive and functional styling to the bar or dining area in your home with this eight piece counter height table and chairs with bench set. Featuring block leg styling with dark finished bases and light finished table tops, as well as plush upholstered seats and ladder styled chair backs, this grouping is unique and extremely comfortable as a seating and gathering grouping for your home. The Elliott 8 Piece Counter Height Table and Chairs with Bench Set by Crown Mark at Wilcox Furniture in the Corpus Christi, Kingsville, Calallen, Texas area. Product availability may vary. Contact us for the most current availability on this product. 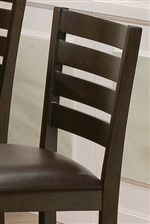 Finish Dark brown base finish on all pieces with light brown finished table tops. Case Detail Thick and straight block legs on all pieces with clean and straight edges. Description: Top Both table tops feature one 18" leaf for accommodation of further friends and family. Deliver smart, sturdy and sleek furniture to the dining or bar area in your home with the Elliott collection. Clean and classic design styling makes this group of pieces lasting furniture choices for your home. 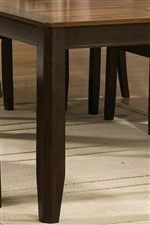 Featuring block leg construction with dark finished bases and light brown finished table tops, as well as plush upholstered seat options, this group is as comfortable and functional, as it is aesthetically pleasing. Add a flare of fashion to your home bar or dining room today with the Elliott collection. The Elliott collection is a great option if you are looking for Traditional furniture in the Corpus Christi, Kingsville, Calallen, Texas area. Browse other items in the Elliott collection from Wilcox Furniture in the Corpus Christi, Kingsville, Calallen, Texas area.